One of my favorite things are leftovers. Especially leftovers from a restaurant meal. When I order a sandwich or a burger at a restaurant, I almost always cut it in half and save one half for lunch the next day. However, a few times in my life, I’ve somehow forgotten to put the food in the fridge at night, and I don’t realize it until the next morning. I’m haunted by these mistakes, as not only am I missing out on leftovers, but I’ve also wasted food. I don’t like to waste food. For some reason this was on my mind last week, to the point that I actually had a nightmare about leaving a burger out on the counter overnight. I thought this was the result of going out to eat several times recently, but as you’ll see, it may have been a premonition. Whenever I go home to Virginia, I bring a big cooler, and I buy an irresponsible amount of Gelati Celesti ice cream. 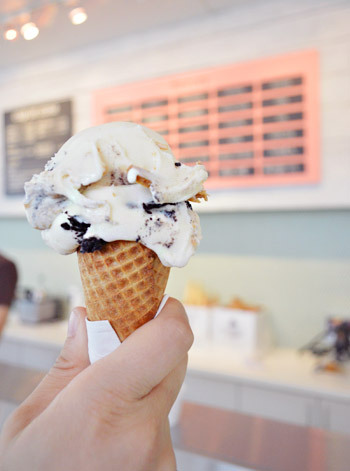 It’s a small chain of stores that make the best ice cream in the world. I have access to great ice cream in St. Louis, but this is even better. So on Saturday I stocked up on ice cream and loaded it into my sister’s freezer that afternoon. After an excellent evening that included a delicious meal and an escape room, I headed to bed in preparation for the long car ride back to St. Louis. A few hours of restless sleep later, I woke up, brought my cooler over to the freezer…and found that someone had left the freezer door open all night. My heart sank. This was bad. Fortunately, the saving grace was that the freezer was partially closed, so while the ice cream was soft, it was still mostly frozen. I packed it into the cooler, added some dry ice from the local grocery store, and hoped for the best. This ice cream will last me months, so I won’t really know for a while if it has that crystalline texture ice cream gets when it melts and refreezes. But I’ll hope for the best. Have you ever forgotten to put your leftovers in the fridge or freezer? This entry was posted on Wednesday, November 29th, 2017 at 11:13 pm	and is filed under My Greatest Fear, superlatives and tagged with superlatives. You can follow any responses to this entry through the RSS 2.0 feed. I’ve been dividing my restaurant servings for years! Great to see there are other out there who also plan their future meals (also, here in D.C. prices are too high not to enjoy it for more than one meal. I won’t say that I haven’t eaten foods that were left out overnight, but suffice it t say, they are well-warmed the next day. You are a braver man than me, Joe!